You are currently browsing the tag archive for the ‘hiking challenge’ tag. 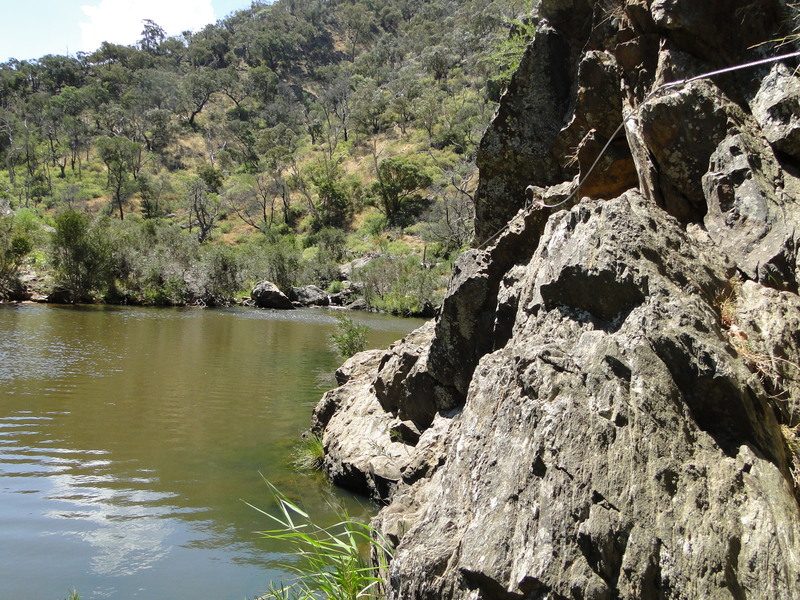 This week involved hiking it in the city at Yarra Bend Park, the largest area of native bushland in inner Melbourne. 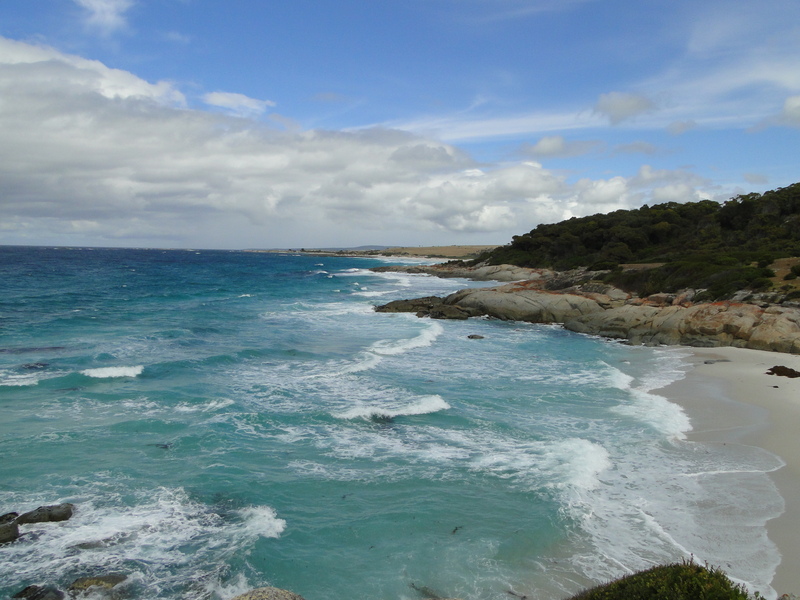 For week 7, Kelly joined me to train for her upcoming hike in Wineglass Bay. We decided to stay in the city, so she met me at our house and we biked 4km up the river to Yarra Bend Park, which is full of mountain biking trails also prime for hiking. We hiked for an hour north along the river to a mass colony of flying foxes. 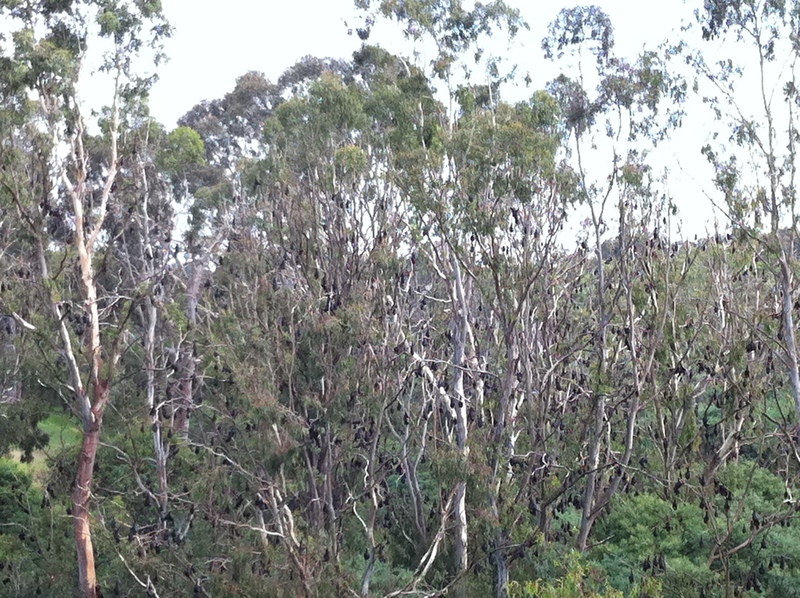 Yep, each of those little black dots, every last one of them, is a native Australian bat, also know as the flying fox. Formerly residing in the Royal Botanical Gardens and surrounding wealthy neighborhoods on the south side of the river in the CBD, the flying foxes have been relocated here over the last 10 years by the parks services to a permanent home that is supposedly better habitat for them (and for Melburians). 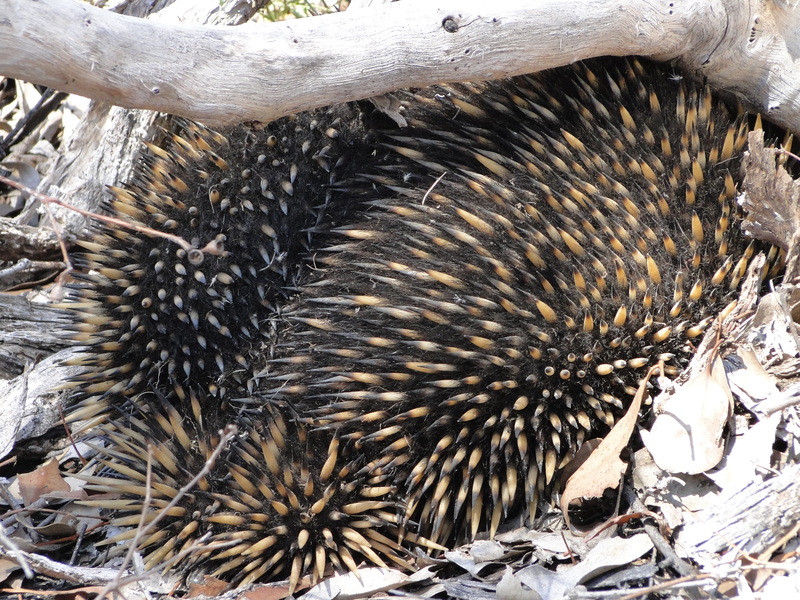 The colony is so large we walked for about 10 minutes among trees this thickly populated. They are numbered between 30,000 and 50,000 depending on time of year. At the end of the colony, we turned back and did the return walk and bike back to my house, and Kelly biked it back to St. Kilda. A few hours later, we meet some friends at the south side of the Yarra River (the bats’ former home). We enjoyed a lazy Saturday afternoon grilling and chilling by the river. 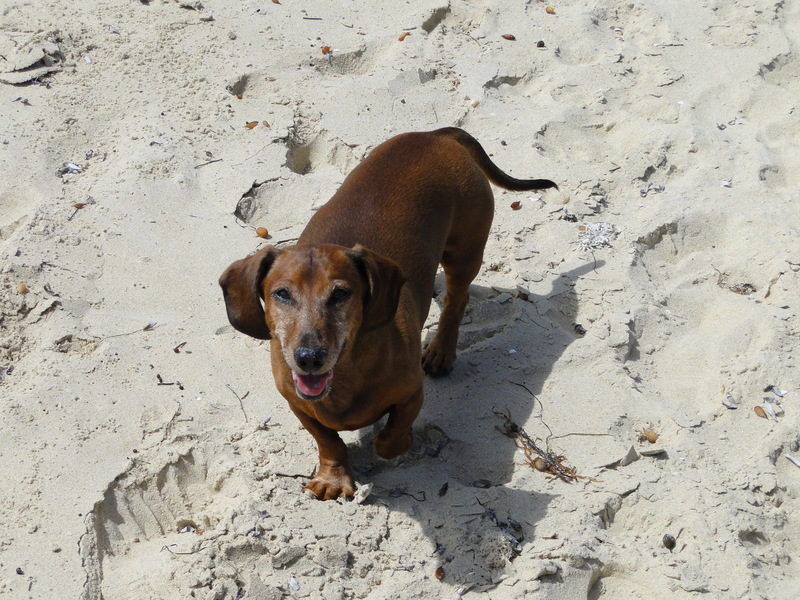 Bentley enjoyed himself doing laps around the BBQ and making friends with other picnickers, showing his charms in exchange for stray sausage bits. 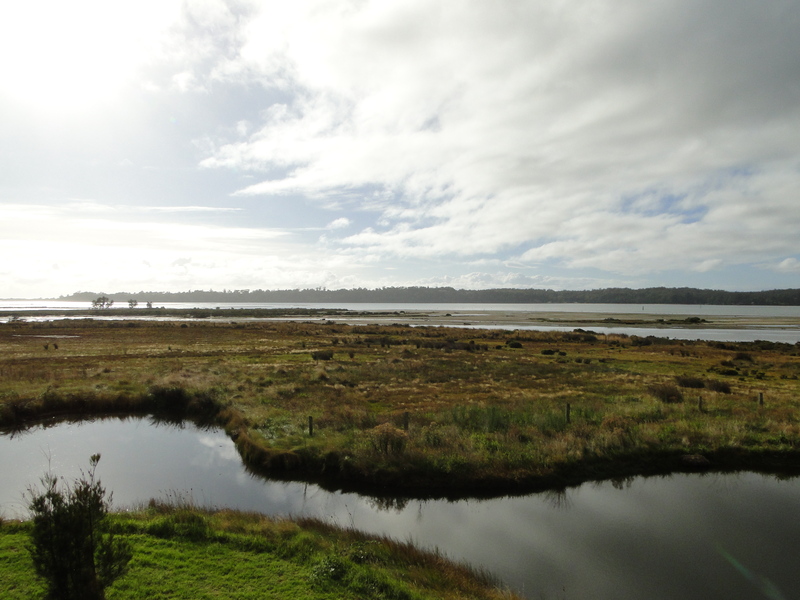 It’s another 3km (one-way) walk down to the river, so all up it was a 14km walking day. 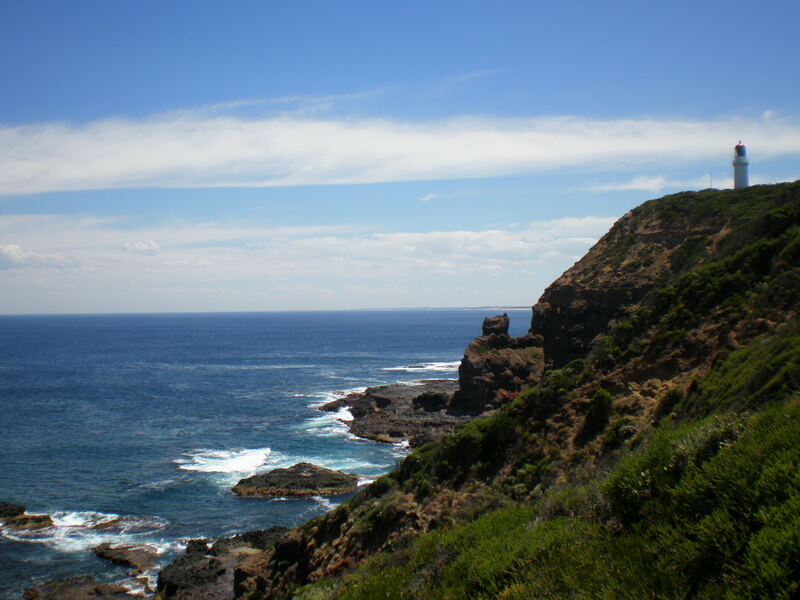 From the golf course, I set out for a familiar landmark – the lighthouse at Cape Schanck. Just 3kms in, I arrived there around the boys’ tee time, so figured a side jaunt down to the beach and back up would help lengthen my overall time and simulate a little elevation change. 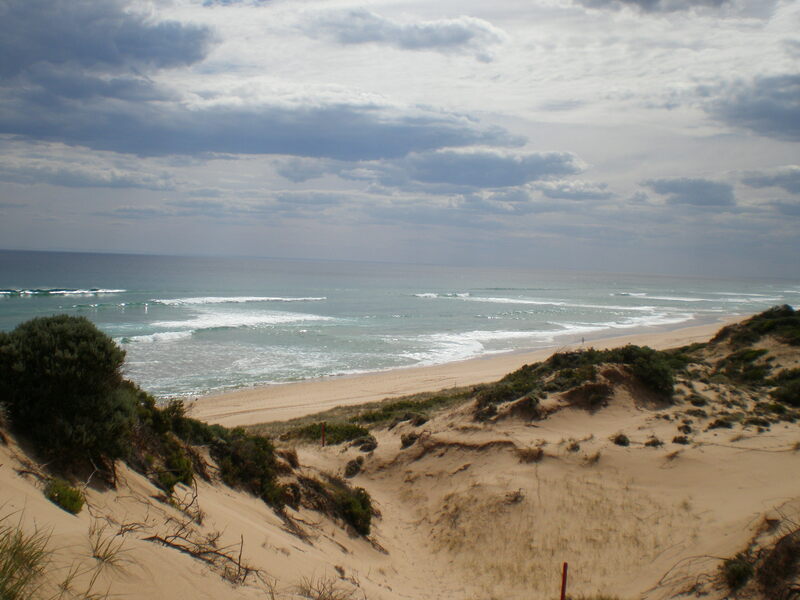 From there, I followed the water’s edge on the cliffs for a 7km stretch to Gunamatta Beach. The brush offered a welcome respite from the blistering midday sun, and the trail was a challenging mix of soil and sand. I had some company along the way — no humans to speak of, but dozens of monarch butterflies flitting along the path. 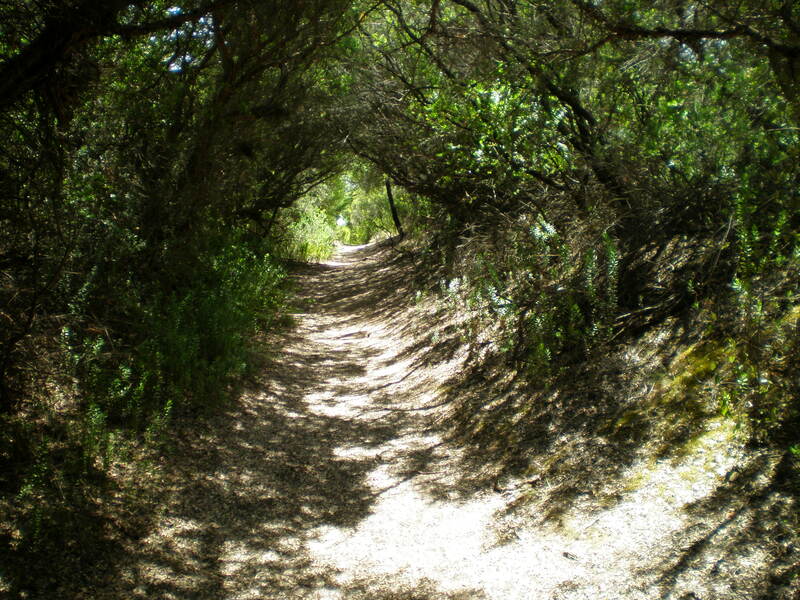 The path looked like no one had passed this way in a long time, other than perhaps the wayward wombat. So I was forced to adopt a robot walk through the thickest brush, to avoid spiderwebs to the face. It’s a technique I perfected in college, in the back woods of Rocky Mount NC, when trips home for the weekend usually involved me patching the fence or clearing brush from mom’s 5 acre homestead. 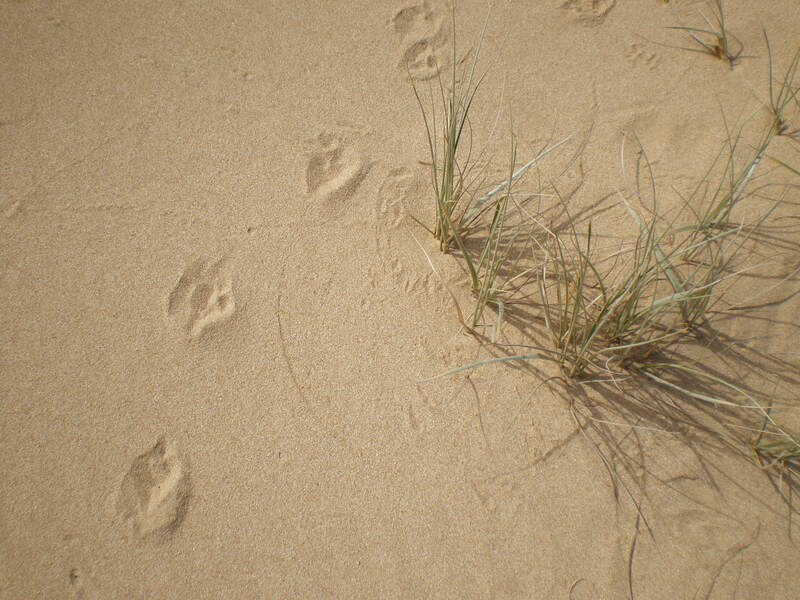 As the path grew more sandy, my legs grew more tired. Hiking in sand dunes is no easy feat. 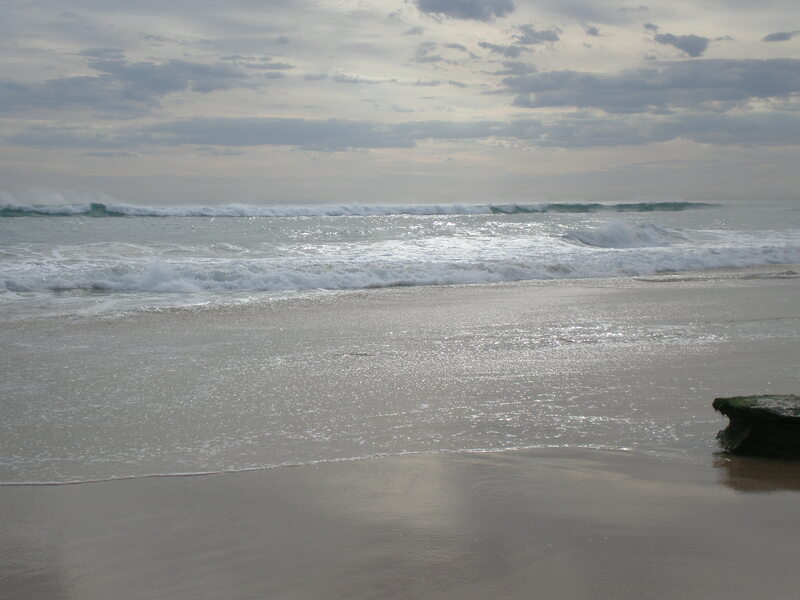 Finally, I broke out onto one of the most beautiful beaches I have seen in the greater Melbourne area. Extremely hot and due for a bit of a break, I dropped the pack and went for a swim. The last leg of the journey would continue on the beach. Good grief, more sand. As the sun set on a beautiful day, I only wished I had the legs to go further (the coastal walk extends another 15 kms or so to the tip of the peninsula at Sorrento). Miraculously, though I was thoroughly exhausted Saturday night, I only felt slightly stiff on Sunday. All this practicing is paying off! 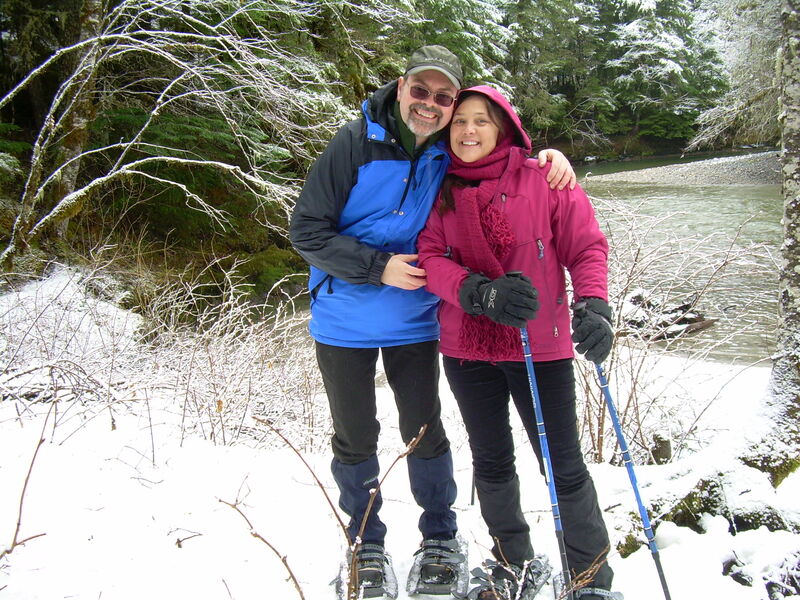 With much indecision, and soaring temperatures for 4 days straight, we went… to the beach. 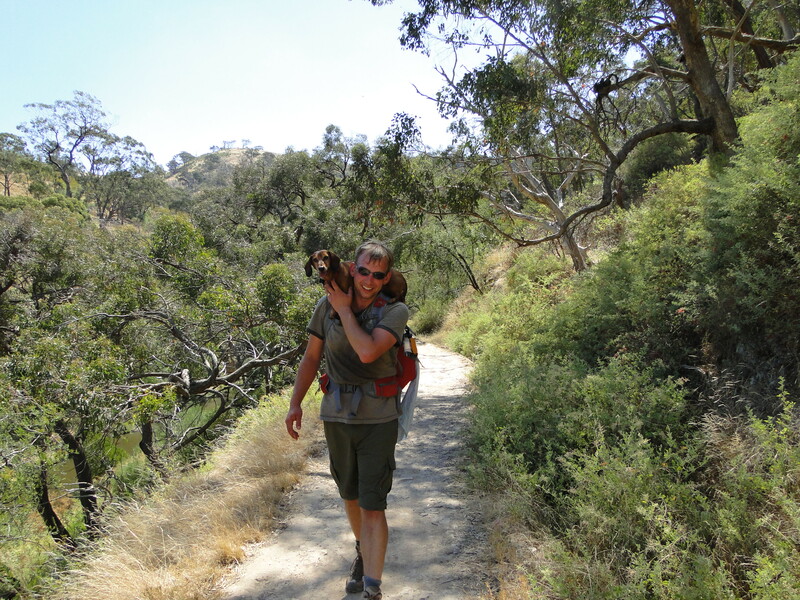 After our very hot excursion at Werribee Gorge, Steve was feeling a bit hiked out. And it was, as he put it, “stupid hot”. So on Friday, instead of hitting the road for another hiking adventure, we did a nice 15km bike ride down the coast of Port Phillip Bay, from St. Kilda to Brighton and back. 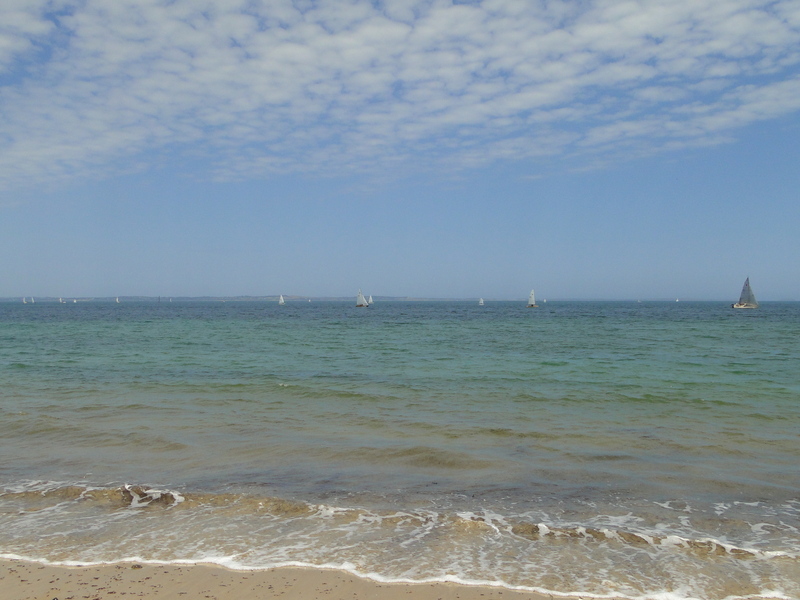 And on Sat, we rounded up Kelly and Adam and escaped the heat of the city, fleeing to our favorite ocean-side beach on the Mornington Peninsula. March is going to be quite a month on our feet. Among other things, we’ve committed to hike the Milford Sound Track in New Zealand with dad and donna — it’s a 4 day, 55km hike through fjordland on the South Island. Should be pretty awesome, and a physical challenge for all of us. If past is any precedent, it’s important to prepare properly for multi-day hikes… So we’re determined to do a series of training hikes, one every week for the next 2 months, to get read for the big show. I’d learned the week before, when an impromptu urge to bike to work during the holiday lull hit me, that although it’s a short 3km direct route from Hosie Street to the city, it takes 3x as long if you follow the winding Yarra River (a full 10 kms). Fully aware of my ridiculous appearance, I strapped on the hiking boots and a pack weighted down with clothes and books and trekked a 13km loop along the river, through the CBD, and back down bustling Bridge Road. Strangely, the rain had not lowered the temperature and an uncharacteristic humidity hung in the air. But the river provided a light breeze and all in all it was a good test for distance (if not elevation).